People might wax poetic about the fall foliage or eagerly await summer, but the season I look forward to the most is Girl Scout Cookie season! New Years Diets are quickly forgotten…at the first sight of those adorable girls in green berets I squeal with excitement before buying so many boxes I have trouble carrying them away! My favorites include Samoas and Thin Mints, but I think we can all agree that there’s almost no better combination than sweet peanut butter and delectable shortbread cookie all wrapped in a smooth chocolate coating. Yes, my friends, it’s true. I am firmly on Team Tagalong. 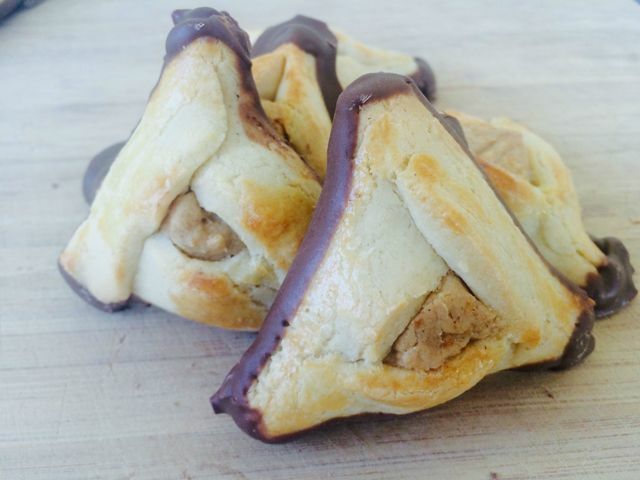 As I was munching on some Tagalongs after work last week and glancing at my calendar at the upcoming holidays I realized it was pretty much my duty to all fellow Jewish food and Girl Scout cookie lovers to reinvent the Tagalong as a hamantaschen cookie. After a few attempts to perfect the recipe, I created an easy shortbread cookie dough, peanut butter filling and chocolate candy coating that my husband and friends couldn’t get enough of. It definitely tops the Chocolate Hamantaschen with Irish Crème Filling I created last year, and that one was pretty good. One note of caution – don’t upgrade the ingredients! When testing this recipe, I discovered using chocolate bark made all the difference in mimicking the flavors of the Tagalong. You might be tempted to go for the high quality dark chocolate, but don’t! The chocolate bark thinly coats the shortbread dough and peanut butter filling for that amazing crunch and taste that you used to only be able to find in that beautiful red Tagalong box. 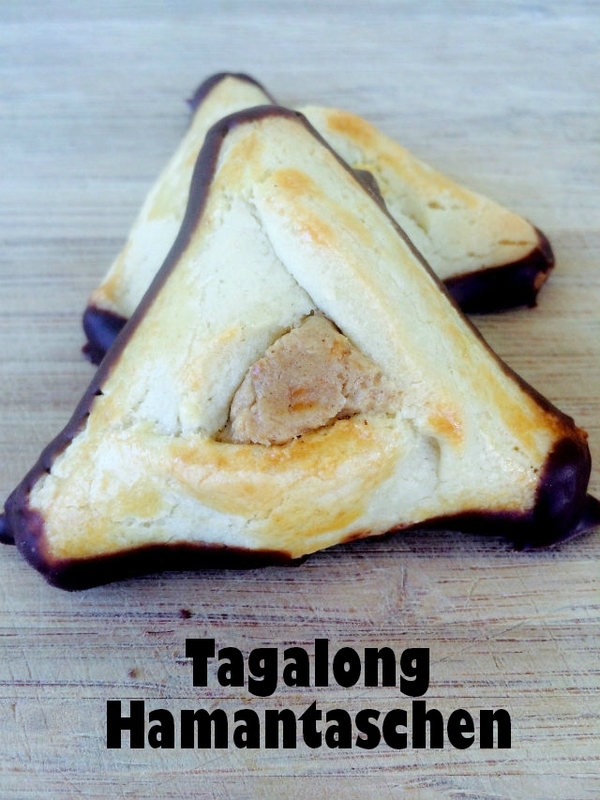 These Tagalong hamantaschen taste identical to the original Girl Scout cookie, but in a Purim-perfect package your friends and family will adore – Scouts’ honor! In a large mixing bowl, cream the butter and sugar together. Add eggs one at a time, then cream/milk and vanilla and blend until mixture is smooth. Fold in salt, baking powder and flour until just combined. Divide the dough into two discs, cover with plastic wrap and place in the fridge while you make the fillings and egg wash. Mix peanut butter and powdered sugar in a small mixing bowl until thoroughly combined. Beat egg and cream well together until combined to make egg wash. Set aside. Roll out the first disc of dough on a well floured surface. Cut circles with a floured drinking glass or cookie cutter as desired. Brush lightly with egg wash.
Place a teaspoon of the peanut butter mixture in the center of each circle. Fold into a triangular shape, pinching each corner firmly to seal. Place on parchment paper lined cookie sheet and brush lightly with egg wash. Set in fridge to chill for 10 minutes. Repeat with remaining dough. Bake chilled cookies at 350 degrees for 14-17 minutes, until golden brown. While cookies bake, place the chocolate bark in a glass bowl. Microwave in 20 second intervals, stirring until melted. Once the cookies are done, let them cool on the cookie sheet for 3-5 minutes and transfer to a cooling rack until cool to the touch. Dip the bottom of each cookie in the chocolate bark and set on parchment paper. Place back in fridge until chocolate is set.